Why do I call my studio, Hanged Man Studio? This is the scene depicted in the tarot card. The gallows represents Yggdrasil, the world tree. Its root penetrating deep into the underworlds its limbs and branches supporting the heavens. 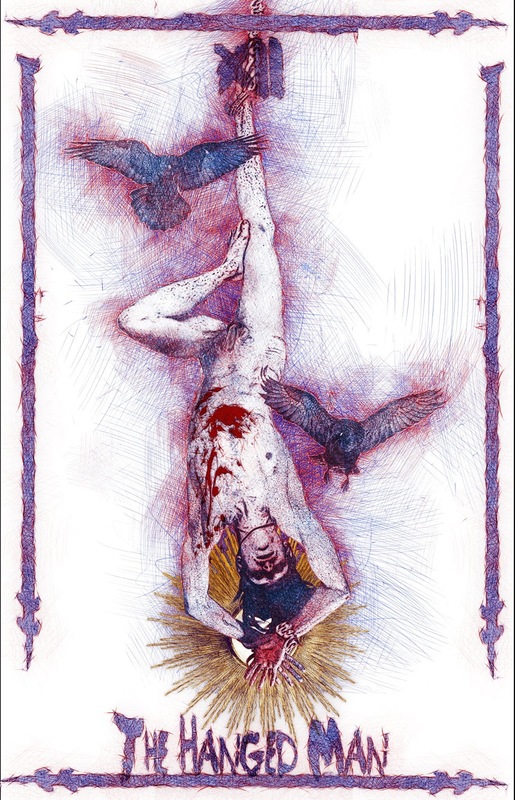 Odin is the hanged man--offering himself to him self he enters the land of the dead and learns the words of power and of knowledge. The parallels to art and the creative process might be a little overblown. Especially from an guy that draws dragons for a living. But, there is something to the self sacrifice, and solitary nature of of the creative process --of reaching into unknown and unexplored areas of your mind and seizing the inspirations that hide there and wrestling them on to paper. That is the name sake of Hanged man studio. Just a guy making a living from his art and imagination--I have found a nice little niche for myself that satisfies my anti- authoritarianism, reclusive nature and need for adulation all at once.